San Francisco 49ers quarterback Colin Kaepernick did not stand for a playing of the national anthem. He explained: "I am not going to stand up to show pride in a flag for a country that oppresses black people and people of color. To me, this is bigger than football and it would be selfish on my part to look the other way." 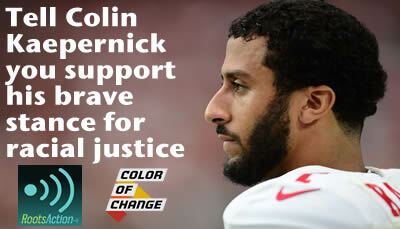 As a result, Kaepernick has received an avalanche of criticism and racist abuse. Colin Kaepernick: We support your right to protest in support of racial justice. Thank you.